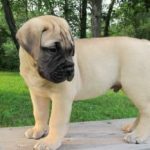 If you own a Bullmastiff, or if you are thinking about purchasing or adopting one, you might be wondering about the most common Bullmastiff temperament traits. When people are choosing a dog breed, they often want to fit the temperament around their lifestyles and families. When deciding if a Bullmastiff will fit in with your lifestyle, consider several types of Bullmastiff temperament traits in various environments and social situations including sociability with family, new people, and other dogs. It’s also important to understand other temperament qualities so that you can better understand the reasons for why he does the things he does. With this knowledge, you will also be able to better understand the best ways to train him. 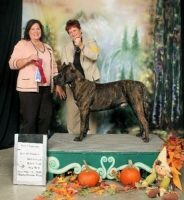 This breed sometimes intimidates people because of it’s size, but Bullmastiffs are usually calm and gentle. They tend to be happy and confident with their independence. What is useful to understand about the Bullmastiff is that it was bred for guarding purposes. Consequently, it has a territorial nature. Its instinct is to protect the family and territory. Some people confuse their strong-willed nature with stupidity. Although they are pack animals and love to be part of the family, their dominant nature often causes them to test boundaries even after the owner has established himself as the leader. People sometimes confuse this boundary testing as a sign of stupidity. Bullmastiffs will sometimes not follow commands, consequently they need an owner who has a firm but loving hand. Punishment is not the best course of action for a strong-willed personality type; it will only make a Bullmastiff more stubborn. Instead, use rewards and praise as training techniques. Bullmastiffs tend to be good with children, due to their tolerant natures. They understand the ways that children behave, and they are very loyal and protective of their family. 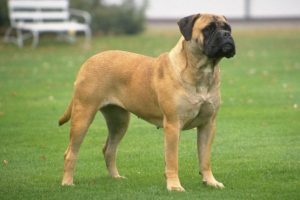 In fact, this is actually where some of the positive Bullmastiff temperament traits shine best. Their docility, loyalty, and courageousness are most apparent with the most vulnerable family members. They will also go to great lengths to protect family members, especially family members who are children. Bullmastiffs can have a dominant personality, and they must be socialized and trained from an early age. This is partly because, due to their dominant and independent natures, they sometimes do not agree with other dogs. They also need a firm and assertive approach in training from their owners. Bullmastiffs will often push boundaries, so they need supervision. Although their dominant personalities might mislead people to believe that they are not good family pets, the opposite is actually true. Due to their loyal and primarily docile natures, they are great for many families. They can also get along with other animals that they have been raised with. Just don’t put them with other dogs of a similar size. They will most likely try to dominate the other dog if they feel that the other dog threatens their status. They are known as excellent watch dogs, so they must be introduced to new people because they are wary with strangers. This is another reason why they must be socialized from a young age. If they are, it will feel more normal to accept new people that you introduce to him. 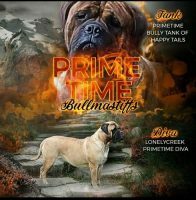 Bullmastiffs can be wonderful pets for an owner who is able to take charge in an assertive an loving manner, but the Bullmastiff temperament is not for every owner personality and lifestyle. 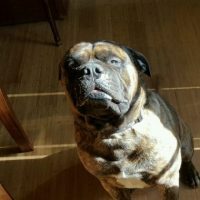 If you are thinking about getting a Bullmastiff, think about what you want from a dog and what your personality and lifestyle is like. 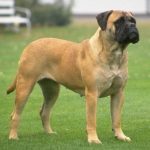 If you already own a Bullmastiff and want to understand his behavior better, implement a few of the outlooks on training, and make sure that you are the loving but firm owner that your Bullmastiff needs.